When September hits, immediately I crave apple pie, I love a good apple pie, especially one with ice cream…YUM. While I know it’s not September…you need to know that I just couldn’t wait for something “apple”. 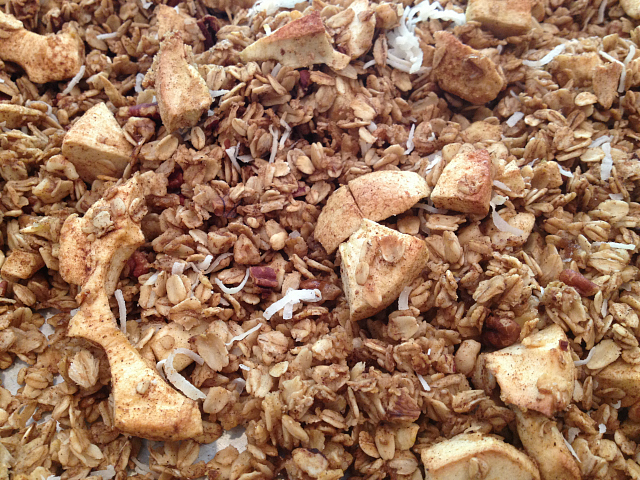 So, I had to make my apple pie granola. 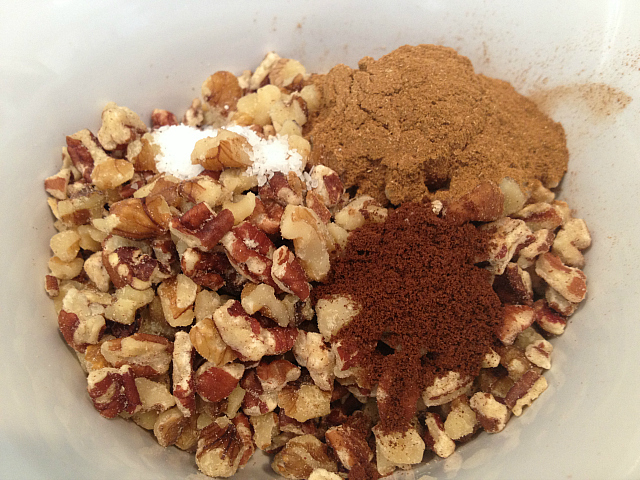 I just love this recipe…and I love granola. I can eat granola with some milk in the morning or some yogurt in the afternoon, as a snack and sometimes I eat granola as a little snack late at night. 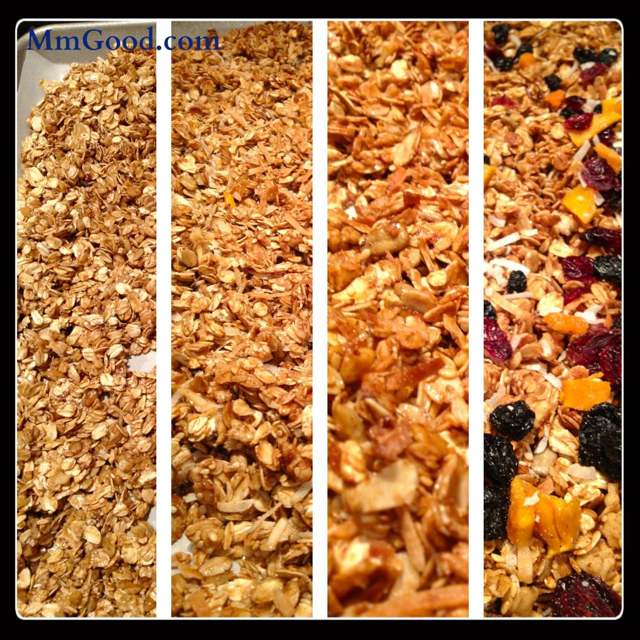 You will find this granola recipe is very different then your traditional recipes as this one tastes like an apple pie. It even starts out with apple juice that you concentrate, I’m not saying that this is a super healthy recipe, but it doesn’t use as much oil as some that I have made before. I made this apple pie granola recipe yesterday and Kelsi came home and nibbled on some of it…she was so cute as she’s like “mom it feels like Christmas with this granola”, I think it’s all that cinnamon! Traditionally I tend to use cranberries and blueberries, in this recipe I use dehydrated apples that I chop, it adds great texture. 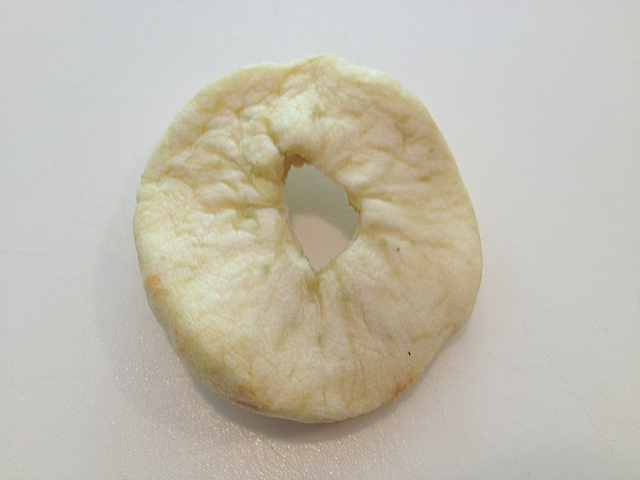 I baked it for 10 minutes and tossed…see how “wet” it looks? I let it cool off completely before I put it in my beautiful glass dish. 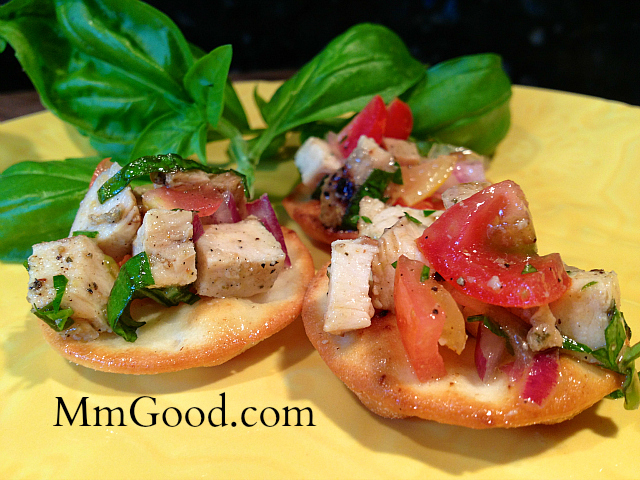 I know you will like this very simple and easy recipe! Please visit my YouTube channel and subscribe and like my videos, it encourages me to continue making them and thank you again for all the support I receive and the emails. Preheat your oven to 350 degrees. Prepare a baking sheet with parchment paper and set aside. Place apple juice in a pan and cook on medium low heat until it reduces down to 3/4 of a cup. Once your apple juice reduces to the 3/4 of a cup, add your honey, oil, and salt. While your apple juice is reducing, put your granola, milk powder*, chopped nuts, seasonings and nuts in the bowl and toss. Add your apple juice, honey and oil. 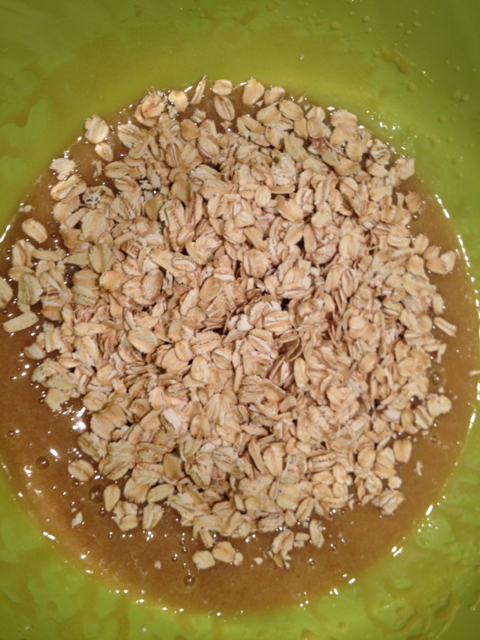 Once it's all well mixed, pour your mixed oatmeal onto your prepared baking sheet, add your almond extract. 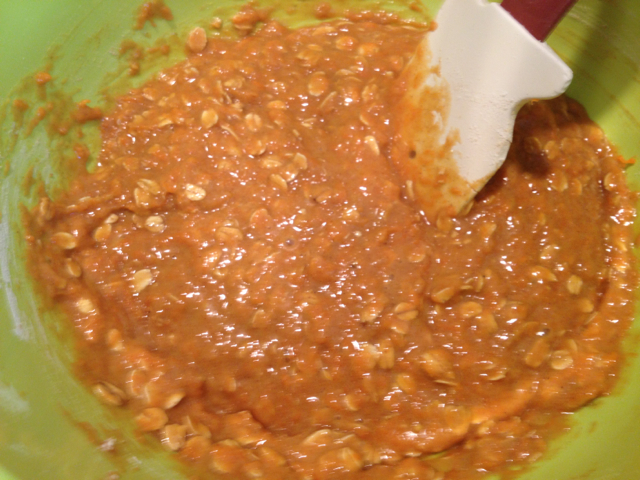 Add the brown sugar and coconut flakes and almond extract. Bake for 30-40 minutes tossing every 10 minutes and until it's done. So, I recently was told that my oven is drawing too much electricity which is why my electric bill is over $500 in January. I don’t buy that to be the reason for the increase but nonetheless, I decided that maybe I needed to find a recipe that didn’t include baking. 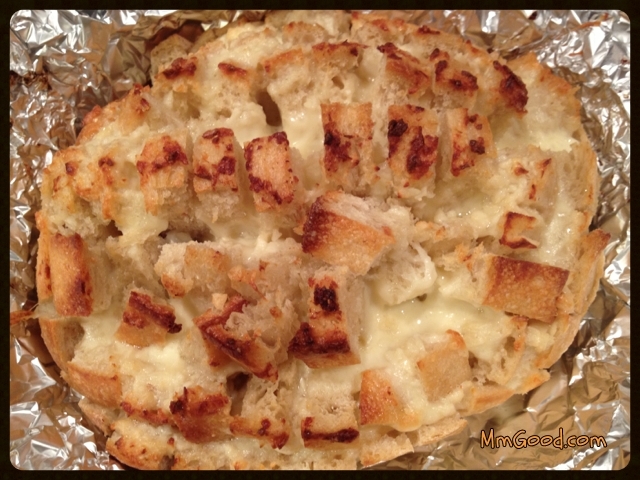 Amazing Garlic Bread Recipe…my way! 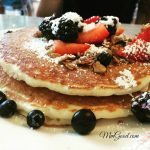 It’s “Scrumptious Saturday” did you think I’d forget? I’m sorry for the late post but today is also my daughters birthday. So I must say that while most people are preparing for the Super Bowl with lots of appetizers…like hot wings, dips and sandwiches, I have a house filled with girls wanting pizza, salad and cake. So I thought I’d have a little fun by making some garlic bread (my way). While at the market I found a sourdough bread, it had a nice hard crust and thought it looked fine for what I wanted to try. I cut preheated my oven to 350 degrees and sliced my bread. 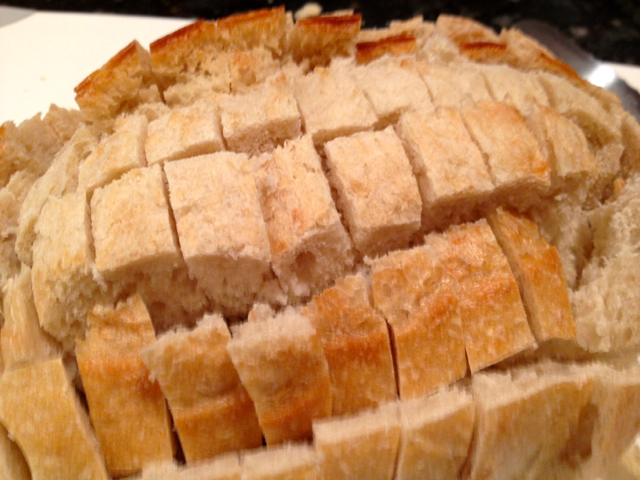 In slicing the bread, I did it without cutting the bread all the way through so it looked like little cubes. 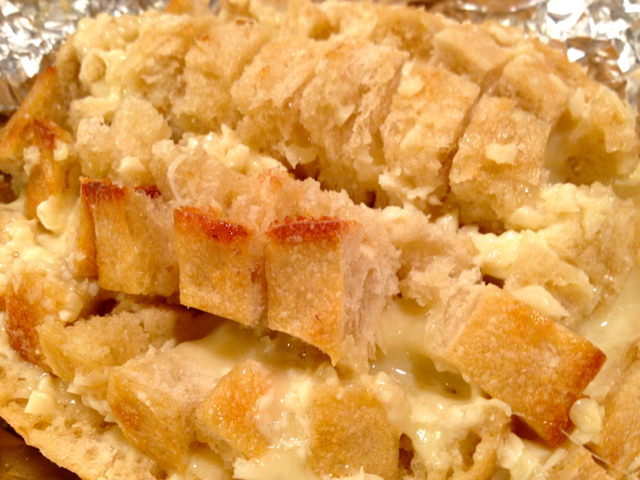 I ladled the melted butter, garlic and Parmesan cheese on top of the bread….see where this is going??? lol I wrapped the bread with aluminum foil, placed it on a baking sheet and baked it for 15 min or so. I took it out and checked to see if the cheese was melted, not quite where I wanted it. 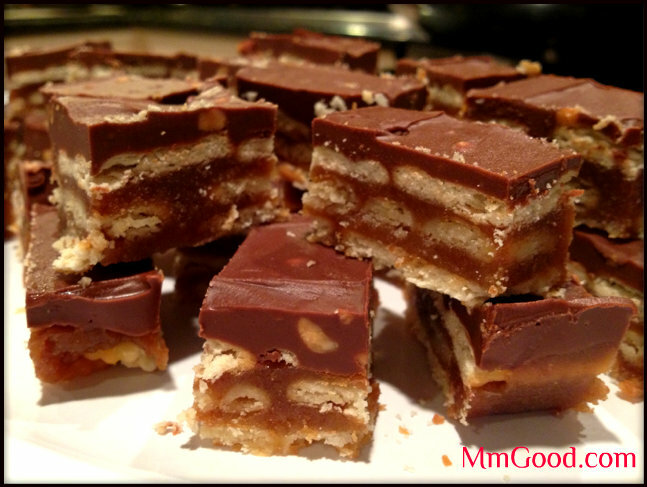 I uncovered it and baked it for an additional 12 minutes or so…YUMMY…the kids loved it! and I have to say…so did I, I hope you do as well, enjoy! 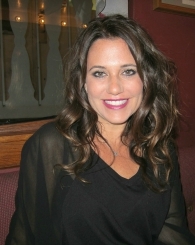 PS – Don’t forget to subscribe (i have a box labeled “subscribe” to get all my new recipes emailed to you! Slice your bread into cubes carefully not to cut through to the bottom. 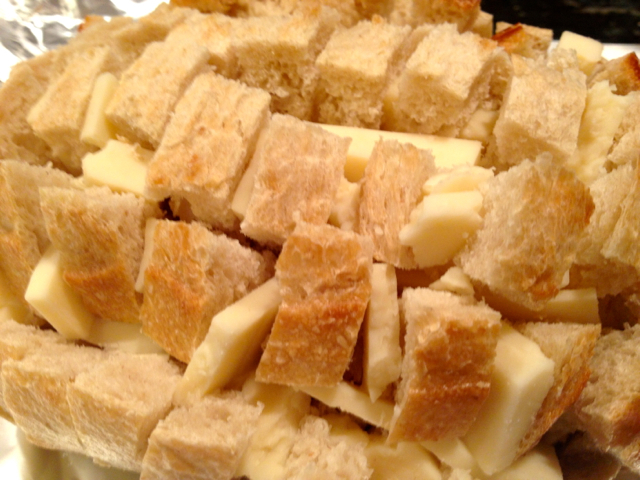 Add your monterey jack cheese between the sliced bread. Melt your butter and add garlic and Parmesan cheese. 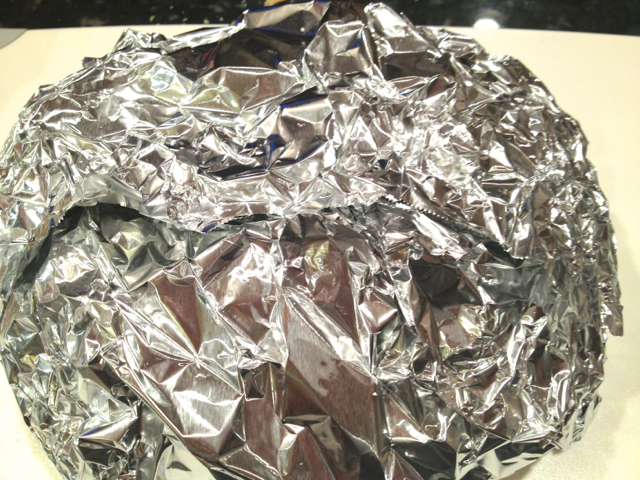 Once melted, ladle your melted butter, garlic and Parmesan cheese over the bread and cover with the aluminum foil. Bake for 15 minutes, remove from the oven, uncover and place back into the oven for an additional 12-15 minutes or until the cheese is bubbly and bread is crusty. 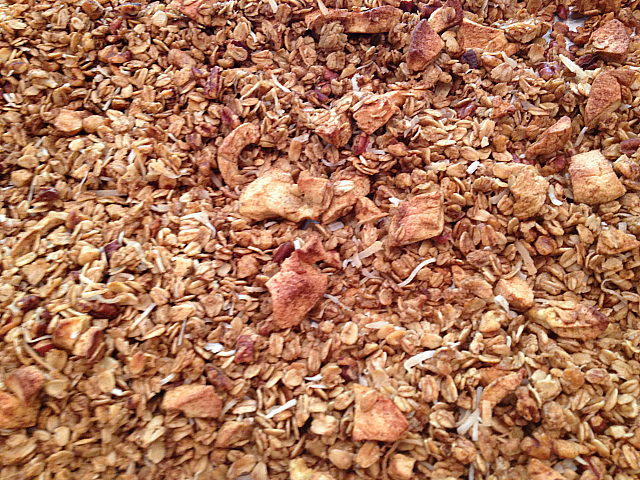 I Love…love…luv granola! The funny thing is I didn’t grow up eating granola and really never appreciated it until I took a cooking class 7 or 8 years ago. Once I saw how easy it was to make, I was sold. I gave it away to neighbors for holiday gifts or friends just because. 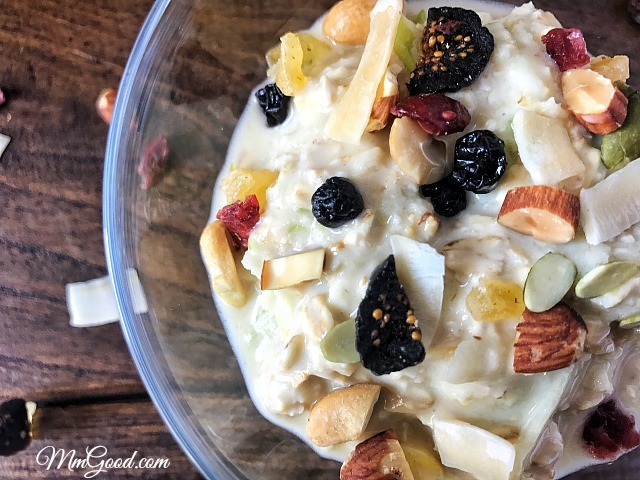 I find granola to be a great comfort snack, it’s simple enough to grab a handful and get a light pick me up in the afternoon or you can use it for a healthy breakfast in a parfait, it can be sprinkled in hot oatmeal. If you put some in your favorite muffin mix, it makes a simple muffin into a new creation. You can even sprinkle it on top of ice cream. 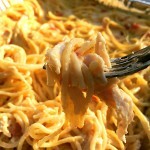 It’s so easy to make, now that I know how and you will find it easy to make as well. 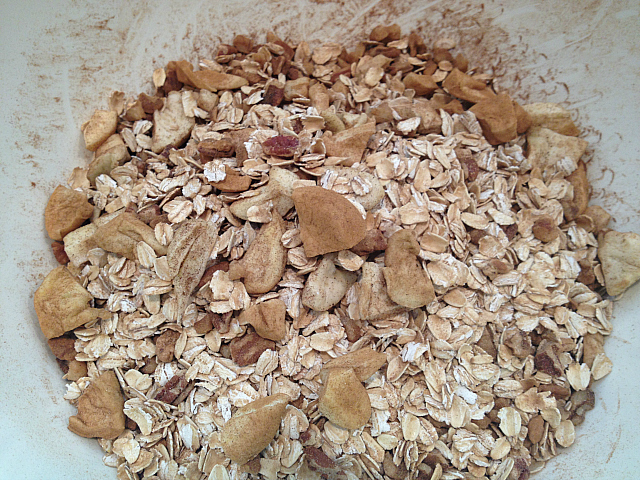 First you simply put your oatmeal, sesame seeds, sunflower seeds, nuts, cinnamon, vanilla extract & salt in a bowl and toss. Then you put your syrup and sugars in a pan to melt. 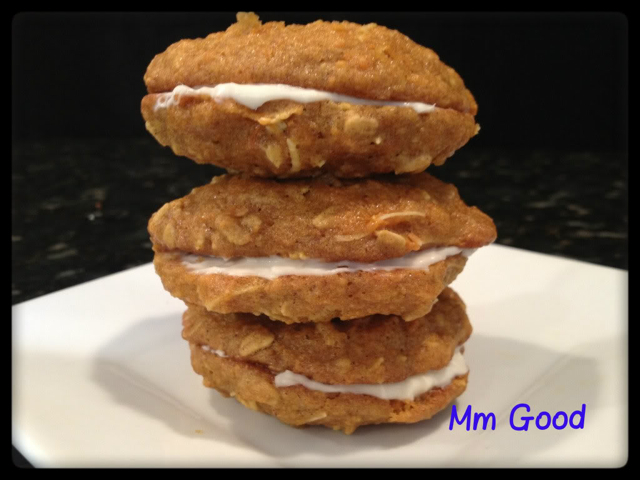 Once it’s all melted you pour the now liquid on top of your mixed oats and then you bake. I tend to bake in 10 minute increments until I get the color I like. You can see how in 30 minutes of baking where it starts off and how it looks completed. When the granola is no longer moist and it’s reached the color I like, I remove it from the oven and I put the fruit on top. If you bake the granola and put the fruit in and then bake it, the fruit will burn and you will have to start over so wait until the end so you don’t dry out your fruit. 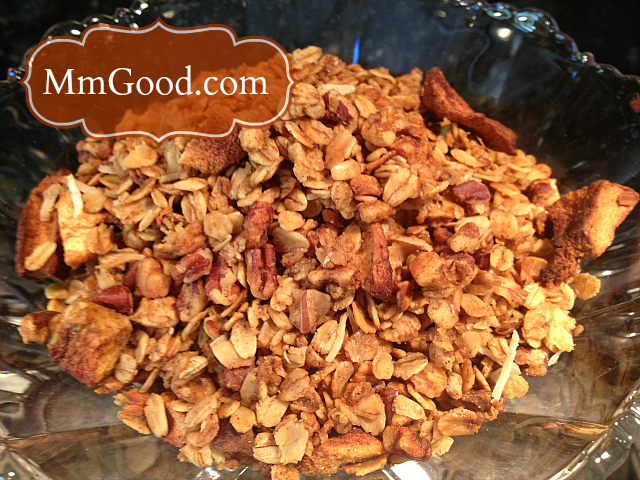 I hope you enjoy this granola, it’s one of my favorites! Preheat your oven to 350 degrees. 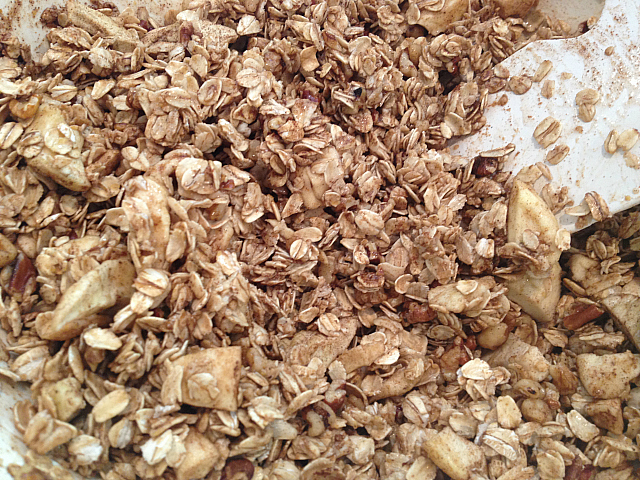 In a large bowl, combine your oats, sesame seed, sunflower seeds, nuts, cinnamon, salt and vanilla extract. You can toss lightly. In a sauce pan, place your brown sugar, your maple syrup and oil and cook until all the sugar is dissolved. Toss into your large bowl of oats. 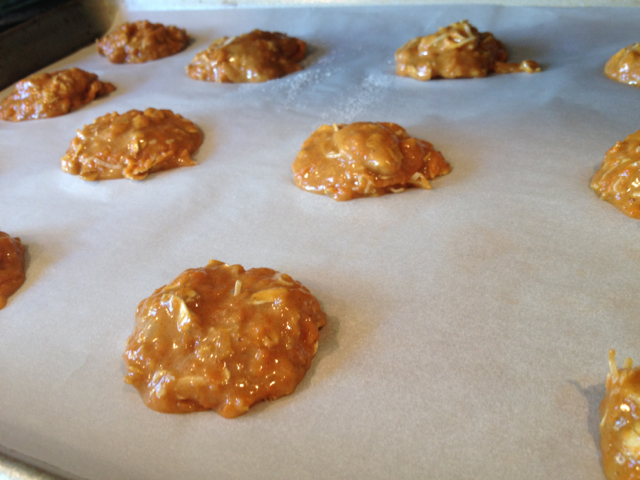 Place your mixture on a baking sheet (you can line it with parchment paper or not) and bake for 10 minutes. While your oats are baking you can cut up your mango and measure out your fruit. 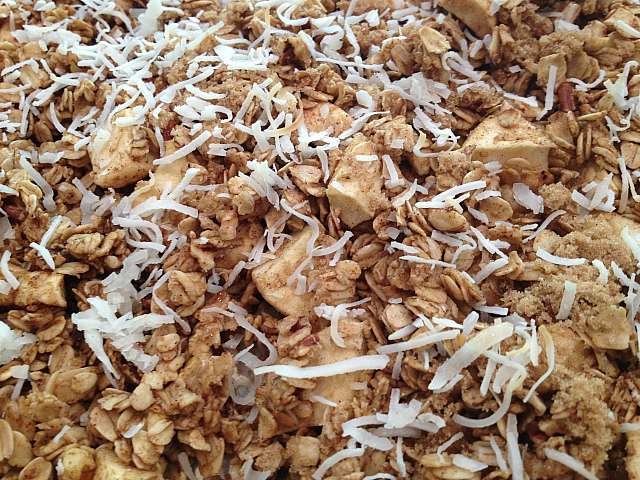 Remove the granola from the oven, toss the granola, add your coconut and bake for an additional 10 minutes. 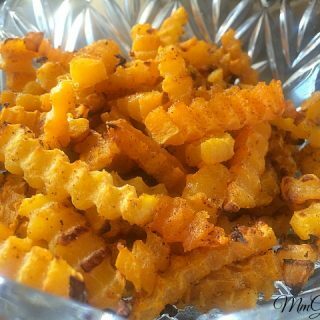 Toss again and bake for another 10 minutes or until you get a golden color and is no longer moist. Remove from the oven and place your dried fruit on top. Once the granola has cooled completely, you can place in a container. 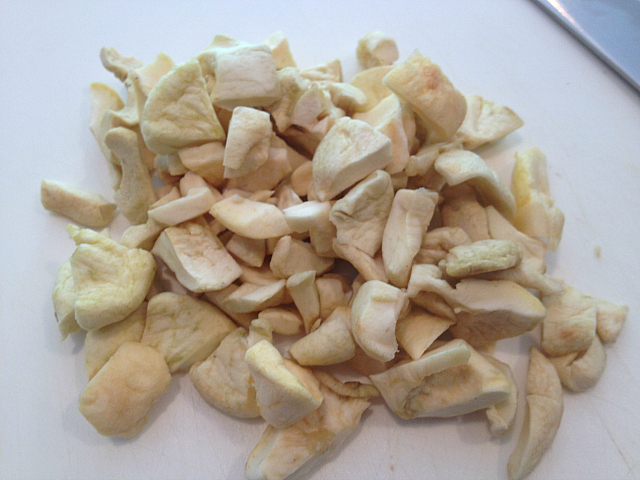 While I may have suggested the nuts and dried fruits, you can add any type of nuts or dried fruits. So I’m one of those patients that sit in the doctors waiting room, I look through the magazines and then of course I’m going to find me a great recipe that I just have to try. So, I end up asking the receptionist to print me a copy of a page…of course these days I pull out my cell phone and just take a photo. Well, this recipe is one of those kind of recipes. 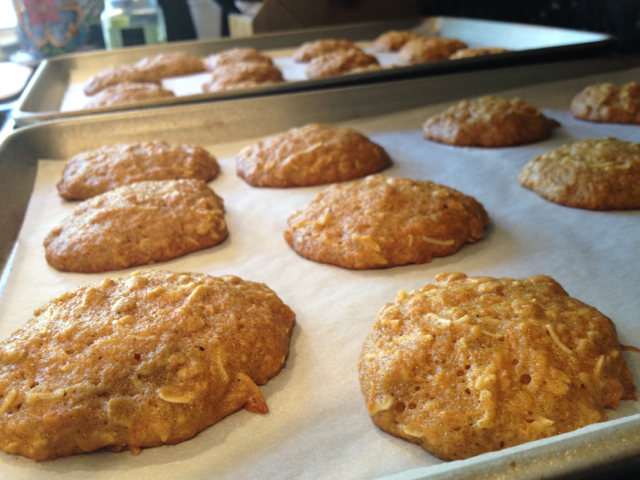 My son was home ill from school today so I thought what a perfect day to bake him some healthy (yes healthy) cookies. The recipe said that they are really meant to be eaten for breakfast but we think they can be eaten any time of the day. 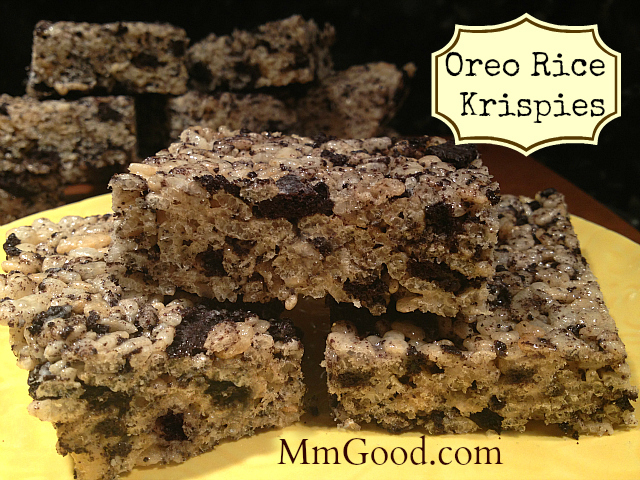 I did modify the original recipe by omitting 1/2 cup of raisins and I added a few more things to the mix. If you like raisins…then add em…we are not fans of raisins. and you make little sandwiches out of them. 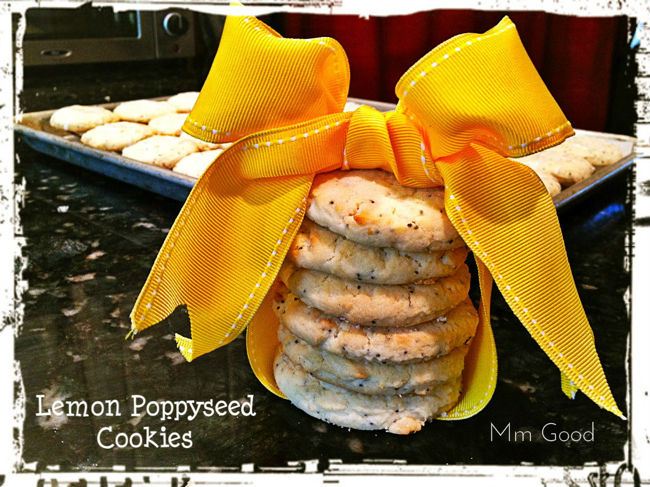 These cookies, wrapped and in the refrigerator, will last up to 3 days. Sift your flour, baking powder, baking soda and pumpkin pie spice together. Add your salt to this mix and set aside. 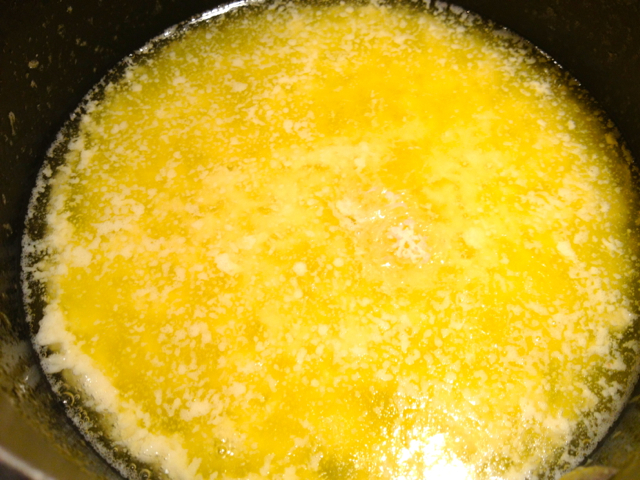 In a large bowl, add your oil, brown sugar, white sugar and egg. Mix until it's well blended. 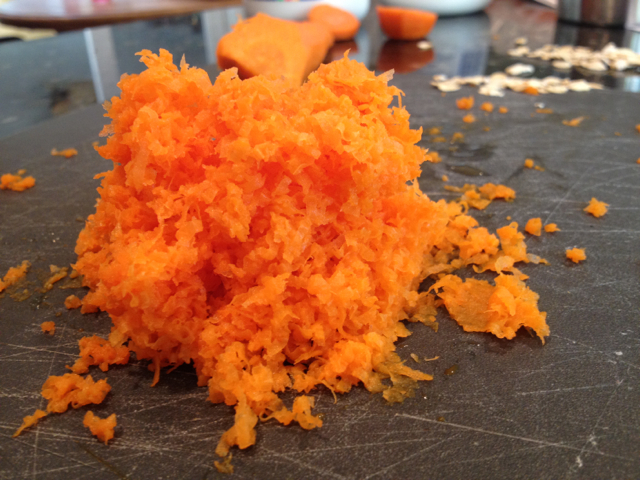 Add your dry ingredients, oatmeal, carrots and coconut flakes. Mix just until it's all blended. Drop your dough, by tablespoons, onto the lined baking sheets about 2 inches apart. Bake for 10-12 minutes or until the edges of the cookies begin to brown. Remove from your oven and let cool. 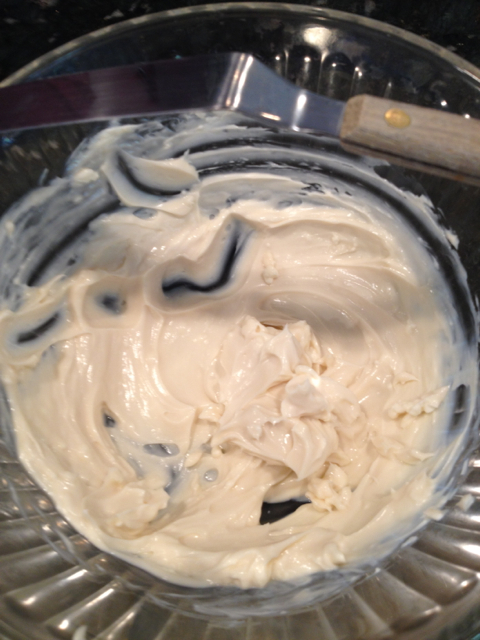 In a small bowl, mix your cream cheese with your maple syrup. After your cookies have cooled down (if they are too hot the filling will melt so make sure to wait until the cookies are cooled), spread about 1 tablespoon of the filling on the flat side of the cookie, top with the remaining cookie and enjoy!